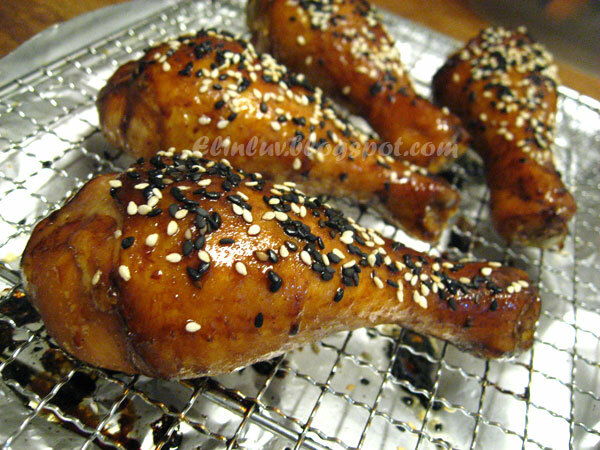 Back to this roasts before my thoughts go astray again.....I know Jo and Daddy loves roast chicken ,so I make them ' Red Wine , Honey & Sesame Roasted Drumstick ' ....tender and juicy on the inside with a slight crispness on the outside. The sesame seeds gave it a nutty fragrant and the honey and red wine marinade enhanced the flavor further....mmmmm yummy ! Mix all the marinade sauce ingredients together in a small bowl. 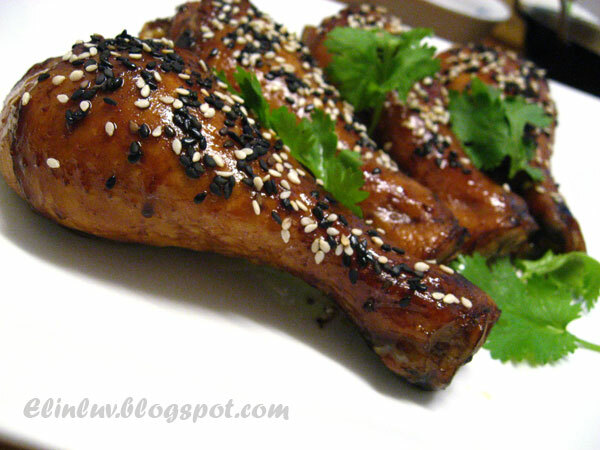 Pour over the drumsticks and leave it to marinate for 1 hour. Brush olive oil on the marinated drumstick and place them on a wire rack over a baking sheet lined with aluminium foil to collect the drippings . 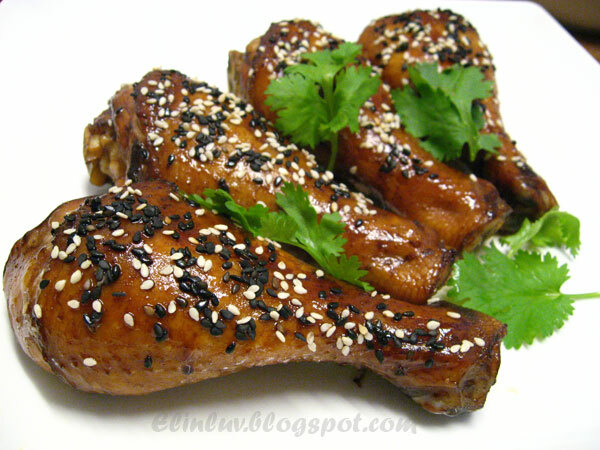 Roasts at 200°C for 40 minutes with basting the drumsticks with the left over marinade sauce for the first twenty minutes of roasting, after which , sprinkle black and sesame seeds evenly over the drumsticks. 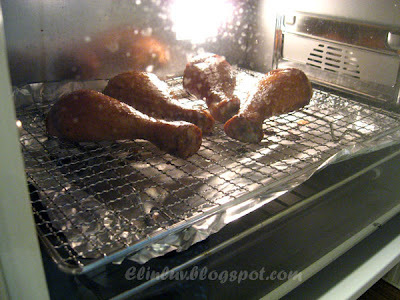 Continue baking another 20 minutes till the drumsticks are properly cooked and golden brown. Elin, you are making me drooling, my salivia is dripping. Looks so delicious, I wish I can have two right now! How come your drumsticks look so good!! Yum....fattening up your little piggy eh? LOL!!! 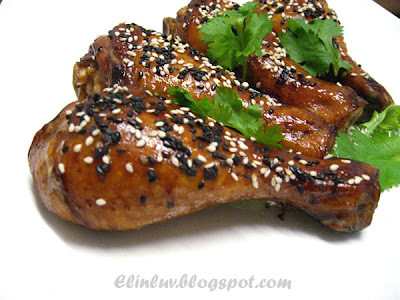 the drumsticks looks very yummy and the short revue about sesame seeds qualities is very informative! Angie Tee...:) Beer & Chivas for Daddy and as for me I prefer red /white wine lol! Claire....heehee...my camera is good !!! red wine and honey?? i seldom eat western food but i walways believe all your combinations are good. btw, havent heard much of the meet up..i think wendy is pretty busy with all her bakes and cooking, haha!! they look so juicy and tasty!!!! Elin, why only 4 drumsticks? Not enough!!! haha... I'm sure you piggy girl will love them. Enjoy & have a wonderful evening. Oh, those drumsticks look finger-lickin' wayyyyy too good! Eatgreek....:) yeah they are moist and juicy and the flavor enhancing red wine...lovely ! Elin, I can tell these drumsticks are so delicious and flavorful with simple ingredients. Very yummy! Beautifully cooked chicken with some great flavors at play. yum yum..can courier some over ka? Looks amazing! I shall use more sesame in my cooking! this little piggy would love a plateful of those delicious drumsticks!!! The sesame sees is a wonderful touch! Congrats momsie! Only 4 pieces, not enough .... they look so good! 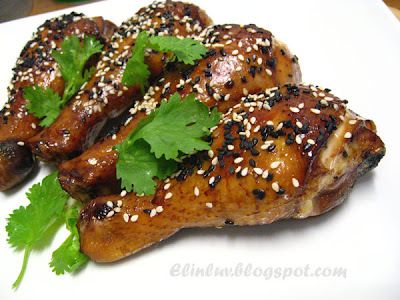 I just LOVE black sesame seeds. These look delish!!! Elin, you have been cooking some good stuff for your daughter, haven't you? !